lizabethan Englishmen also saw the Arctic as a possible path to the riches of the Orient, bypassing the southern routes from which Spanish and Portuguese merchants were gaining so much wealth. In 1576, soldier and adventurer Humphrey Gilbert published a pamphlet titled A Discourse of a Discoverie for a New Pasage to Cataia. 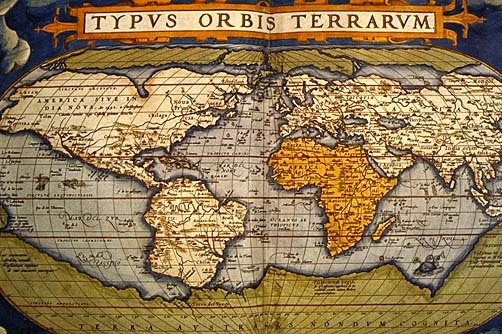 He set out the evidence for a Northwest Passage to Asia across the top of North America, and described the commercial advantages for opening such a trade route. Not only could England become wealthy through trade in gold, silver, precious stones and spices, but it could settle the newly discovered strait with "such needie people of our Countrie which now trouble the common welth, and through want here at home, are enforced to commit outragious offences, whereby they are dayly consumed with the Gallows." A group of London merchants formed a plan of sending Martin Frobisher to find the Northwest Passage on their behalf. 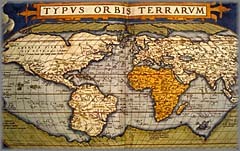 A passage to the north of North America was assumed to exist on this 1565 world map by the Flemish geographer Ortelius. By the 1570s, the renaissance in learning and technology that had begun a century earlier in southern Europe was finally reaching England. One of the leading scholars of the day was Dr. John Dee, who joined the partnership seeking a Northwest Passage. Dee provided navigational instruments, instructed Frobisher's officers in their use, and assembled the books, maps and other information on what they were likely to encounter on this far edge of the world. Latitude is calculated by measuring the height of the noon sun above the horizon. The cross-staff or Jacob's staff replaced the quadrant as the favoured instrument of mariners. 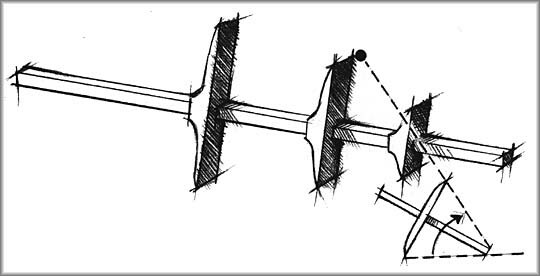 The cross-staff was a wooden rod with a peep-hole at one end, and a sliding cross-piece. 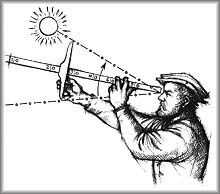 The navigator placed his eye against one end of the staff, and slid the cross-piece until he saw the lower tip at the horizon and the upper tip at the sun or North Star. The altitude of the celestial body could then be read from a scale marked on the main staff. Sailors could find their latitude at sea by measuring the height of the North Star or the noon sun above the horizon. The mariners' astrolabe was a circular bronze plate with a scale engraved around the edge, and a bar with peep-holes (the alidade) mounted on a central pivot. 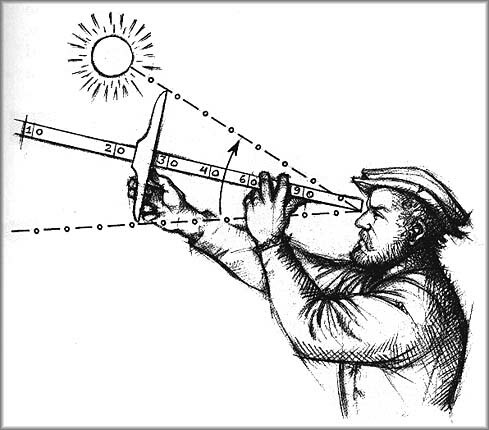 In use, the astrolabe was suspended from a pivot, and the alidade rotated until the star could be seen through the peep-holes, or until the shadow of the sun lay directly along the edge of the alidade. The angle of the alidade was then read from the scale on the astrolabe. With three tiny ships, Frobisher set out from London on June 7, 1576. As they passed down the Thames, Queen Elizabeth I waved them farewell from the window of her palace at Greenwich, and sent a messenger aboard to express her thanks for their hazardous undertaking.